City Council interviewed the four finalists for the open city attorney position at a special meeting Wednesday morning and will continue its discussion about who to hire at its next meeting on Tuesday, Sept. 26. Celia Shortt Goodyear/Boulder City Review City attorney candidate Chris Davis appears before the City Council on Wednesday to answer questions about his qualifications for the position. Celia Shortt Goodyear/Boulder City Review City attorney candidate Gordon Goolsby appears before the City Council on Wednesday to answer questions about his qualifications for the position. 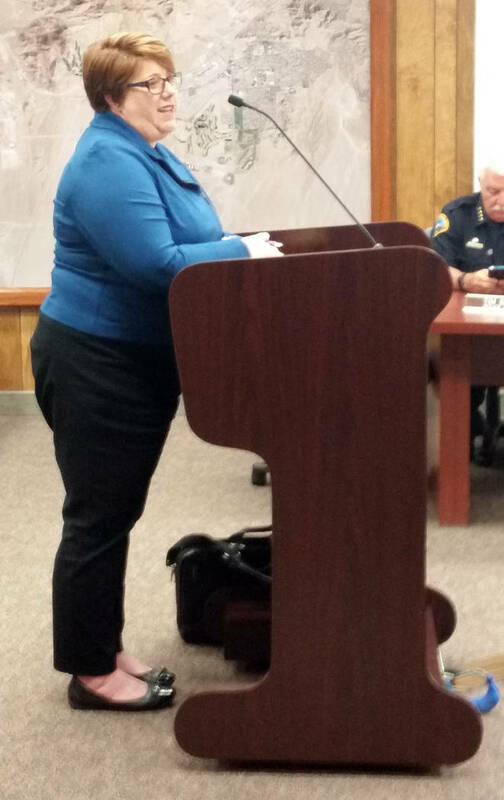 Celia Shortt Goodyear/Boulder City Review City attorney candidate Christi Kindel appears before the City Council on Wednesday to answer questions about her qualifications for the position. Celia Shortt Goodyear/Boulder City Review City attorney candidate Steve Morris appears before the City Council on Wednesday to answer questions about his qualifications for the position. During their four hours with the candidates, council members talked with each of them about their qualifications, what they would bring the city, and why they wanted the position. Each candidate introduced themselves and answered five questions specifically prepared for the interview process. Council members also held a question and answer session with each candidate, which included questions about eminent domain, public service, who the city attorney’s clients are, city charter requirements, constitutional rights, the rights of the city, to whom the Constitution applies, and the U.S. Supreme Court justices. The council members had no other interaction with candidates. Chris Davis, Gordon Goolsby, Christi Kindel and Steve Morris are vying for the position. Davis is an attorney with Las Vegas law firm Cohen, Johnson, Parker and Edwards and served as the deputy city attorney for North Las Vegas from 2006-2012. He said that his roots are in small-town Nevada, dating back to his great-great-grandfather. He grew up water skiing at Hemenway Harbor. Davis went to college at Brigham Young University and attended law school at the University of Utah. He told the council that as city attorney his job would be to make sure the council is “well-advised of the legal ramifications of the decisions” that they are making. “I view my role as doing my best to make sure you have what you need to make decisions,” he said. Davis said that he has experience with civil rights and eminent domain, which are important issues a city will face. As city attorney, he said that his job would be make sure the council is “well-advised of the legal ramifications” of the decisions they are making. In terms of legal skills he was most proud of, Davis said that he is an excellent negotiator. “I really would enjoy the opportunity to move to Boulder City and serve the residents here,” he said. 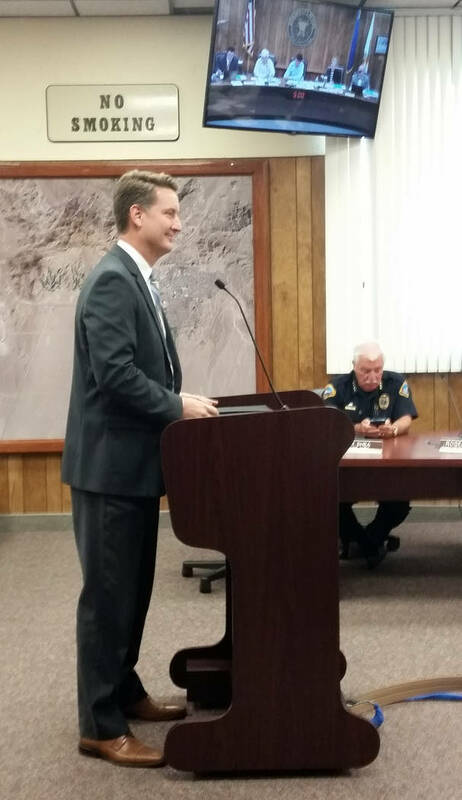 Goolsby is senior deputy attorney general for Nevada’s office of the attorney general. He was raised in California and a small town in Alaska, where he said he learned the meaning of community. He and his wife moved to Southern Nevada 15 years ago, where he ran his own business for four years and went to law school at UNLV. As an attorney, he said that he has more experience in civil court and has worked in other areas of the law including bankruptcy court. When asked by the council about issues facing the city, Goolsby said that he knew growth to be big as he had attended the council meetings since the end of June. He said that he recognized that it was a divisive issue, and as city attorney he would be make sure that the council has the legal foundation for its decisions. Additionally, he said that he had researched the city as a place to raise his family. “To be in a place that has this character is very appealing to us,” he said of why his family wanted to be in Boulder City. In terms of legal skills he would bring to the job, he said would bring the ability to listen and to help the city realize its goals. 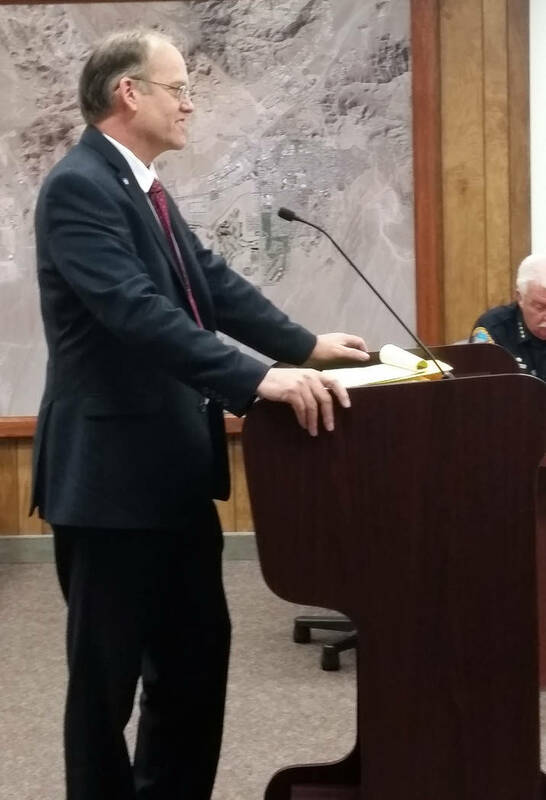 Kindel is the deputy district attorney for Nye County in Pahrump, Nevada. She has experience in the public and private sectors and has worked as the assistant city attorney for Sparks, Nevada, after which she was appointed the city attorney for Mesquite, Nevada, where she has experience in criminal and civil law. In addition, she started her own private practice after working in Mesquite and before going to work for Nye County. Kindel is also an advocate for public service and has volunteered in every area in which she has lived. 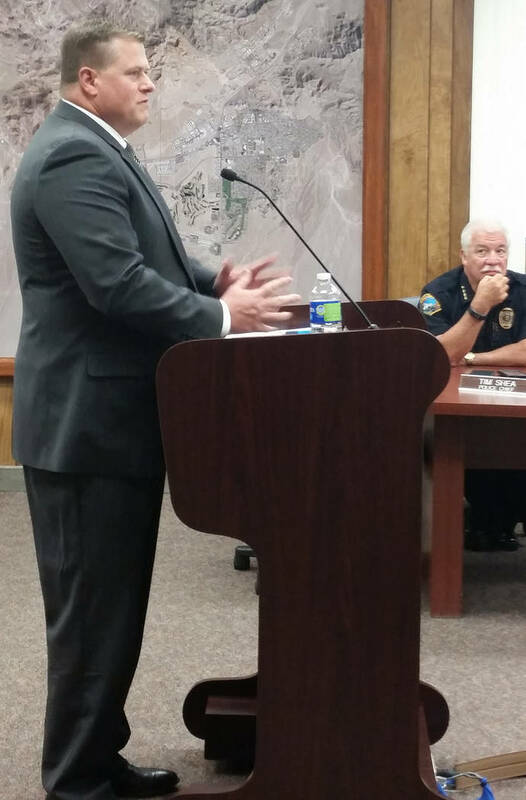 Morris is the acting city attorney for Boulder City, as well as a lawyer with the Nevada firm of Grant, Morris and Dodds. His family emigrated from Norway, and his grandfather eventually came to Boulder City at the age of 19 to work on the dam. As he and his family live in Boulder City, Morris said that he is familiar with the concerns facing residents and that they all have a common cause to preserve it. “I think the greatest threat to that is disunity from within and the inability to share concern in a civil manner,” he said. He also said that the city attorney is not a political office, rather it’s an office to serve the law and plays an essential role in advising. “The job of the city attorney is to interpret and advise but not to take a management position,” he added. Morris said that his main area of legal practice has been civil, but he does have a little bit of experience in criminal defense. “Regardless of the decision, I will always be a part of Boulder City, and Boulder City will always be a part of me,” he said. During a public comment period, residents shared their thoughts about which candidate they thought would be the best city attorney and asked the council to take their time in choosing a new one. Upon completion of the interviews, the council members decided to do further research and come back at Tuesday’s meeting to deliberate and possibly vote on who to hire. ■ How do you see your role in resolving the issues facing the city of Boulder City? ■ What do you believe are the most important attributes to a successful negotiation and give an example of a successful one for you? ■ What experience do you have in drafting land-sale agreements, long-term land leases, and deed preparation? ■ What steps do you follow to study a problem before making decision? ■ Know the City Council is very budget conscious, what areas do you feel compelled to seek outside counsel?